Drummer extrodanaire Rick Sanford conmposed Drop Funk. To his drum and bass, I added some guitar, harmonica (!) and granular synthesis. Tarnish is a 4'27" piece using processed guitar (no that's not a freight train) and the Zoom RhythmTrak 234 drum machine. The cohort records cd More of the Same features over 50 minutes of noisy electronic/guitar compositions wrapped in a white, tactile fabric cover. Much of the music uses MAX, an object-oriented programming environment for the Macintosh. One of the feedback based algorithms of More of the Same is the logistics function, Xnext = rX(1-X), which is used to generate a cloud of string sounds; a backdrop to a hammered din of probabilistic metallic percussion and guitar noise. 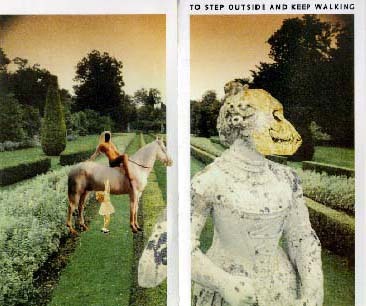 To Step Outside and Keep Walking, a compilation CD featuring Randy Grief, Contact with a Curve, Jocelyn Robert and my 19 minute Doppelkonzert: The Virgin Goddess of Aggression. Excellent Cover! The Polysinatious Records release Guitar Solos features some serious guitar sound processing. Anybody remember Pete Cosey? 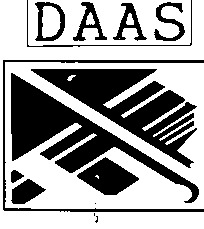 DAAS, improvisational and aggressive electric music featuring Dan Harris on Guitar. Sort of a power trio with the Mac as the third member. Cool transparent cover art by VIG. The Next Generation DAAS's next generation of cassette recordings features granular synthesis, sculpted guitar noise and a catchy tune about bugs. EnergyXT Jorgen Aase's modular audio environment is an excellent VST Host, audio/midi sequencer and has a very cool arpeggiator that will operate on any VST instrument. The demo is fully functional (it's cleverly limited so you can save, but not load patches), but at only 39 euros the full version is a steal. Computer Music magazine writes It's clear that Jorgen is in this business for the love rather than the money. Highly Recommended. Loopy Llama A great jamman style looping VST plug-in effect. Elottronix XL This is so cool, and it's free! It's a Frippertronics style loop recorder. M42-Nebula Currently my favorite VST soft synth. As the name might suggest, well suited to "spacy" sounds, with some nice rhythmic possibilities. Reasonably priced at $45. Snip A very interesting semi-modular VST plug-in, it's website says Snip is an experimental synth designed to generate modulated sounds in the style of the hardware synths of 70s. This free French synth is currently in beta. It could well be my next favorite, but it's a bit of a CPU hog and there is currently no documentation. Synth1 A free VST synth with Arpeggiator patterned after the Nord Lead 2 synthesizer. Organized Trio Guido Scognamiglio's free and very cool VST ToneWheel Organ Simulator with Vibrato/Chorus, Tube Amp and Rotary Speaker. Anwida DX Reverb Light 2.0 my favorite free VST reverb plug in. FMheaven a reasonably priced ($70) 6 operator FM VST instrument that loads DX7 patches. LoopAzoid a free VST Drum sampler that works great with the free tabla samples from swarsystems.com. Crystal a free VST semi-modular software synthesizer featuring both subtractive synthesis and frequency modulation synthesis. Incredibly powerful. Sfz load up this free VST sample player with Soeren Bovbjerg's wonderful (and free!) Steinway grand piano soundfont, or Simeon Amburgey's aptly named Splendid Grand or some of the free soundfonts from hammersound.net. Cheeze Machine a free VST string ensemble synthesizer that emulates classic string synths like the Crumar Performer or the Arp Solina. There are tons of other excellent VSTs out there, many of them are free. kvr-vst.com is my favorite source for finding them. Ibanez AFS75T archtop guitar with Bigsby style vibrato. Goldwave an excellent digital audio editor. Thonk! a very easy to use granular synthesis program for musicians. Currently piled next to the cd player are Fripp & Eno's exquisite The Equatorial Stars, Joe McPhee Po Music Linear B, Rob Reddy's Honor System Songs you can trust, Ohm "Live" on KPFK, Gary Husband The Things I see, Bobby Hutcherson Montara, Jim O'Rourke I'm Happy, and I'm Singing, and a 1,2,3,4, Fernanda Porto Fernanda Porto, Henry Kaiser & Wadada Leo Smith Yo Miles! Sky Garden and gospel to replenish the soul: The Reverend James Cleveland I Don't Feel Noways Tired. John Peel's 30 minute program on the BBC World Service is one of my favorite sources of new and interesting music. Unfortunately, I can't hear it here in San Francisco Bay Area, at least not on the radio. The BBC moved their schedule around, but I'm hoping it will reappear on KALW 91.7 FM eventually. In the mean time, you can listen to John Peel on the internet. His show is also on BBC's Radio 1 Tuesday, Wednesday and Thursday at 22:00 (3 pm PST). This show has an unmatched sense of musical elegance and covers a range of music styles: punk, reggae, lounge, techno, jungle, drum n' bass, surf and r & b. Due to a dearth of information in English, I posted a page on hiking the Mare A Mare Centre: A 7 day hike across Corsica. Corsica is a great destination for hiking. I'm also hosting Rob Freeman's page on hiking the Mare A Mare Nord, another great Corsican hike. Other favorite hikes closer to home are the Cruikshank/Buckeye loop in the Silver Peak wilderness, North Lake to South Lake via Lamarck Col through the John Muir wilderness, the Grouse Ridge-Beyers Lake-Glacier Lake loop in the Tahoe national forest (map of Grouse Lakes Area in .pdf format) and just about anywhere in the Ventana wilderness. I'm a convert to lightweight alcohol stoves for backpacking, and I've made a comparison of seven lightweight alcohol stoves. Minidisc continues to hold it's own. It's still the easiest and cheapest way to make digital recordings on location or in the field. I'm now on my third minidisc recorder, a Sharp MD-MT190W that I bought online from teamdigital.net in Singapore. Combined with my homemade mic it's a winning setup. The quality of the recordings I've made with my minidisc recorders compares with recordings I made with a $1000 worth of equipment (a Sony TC-D5M and a high quality Shure mic) back when I was studying electronic music at Mills College back in the early 80s! My homemade mic page has some examples of my recordings, including some jungle sounds from my trip to Malaysia. Thanks to the resurgence of interest in longboards, it's cool to just ride (as opposed to do tricks on) your skateboard again. The Skate Geezer home page and the Northern California Downhill Skateboarding Association web page inspired me to dig my board out of the basement and ride it. I not only dusted off my old Gordon & Smith fibreflex slalom model, I bought a new Flexdex Kelly Slater 40 longboard. I haven't done anything other than ride up and down the street in front of my house, but if you ask me that's the beauty of skateboarding. If you feel like skating, the street is always there. Cycle magazine is still dead and the world continues to be less interesting. Compensating somewhat is the lively motorcycle magazine scene in the UK. is a great read with the best photography around and its sister publication has the only data on motorcycle reliability that I am aware of. England's excellent Motorcycle News has an equally excellent website. 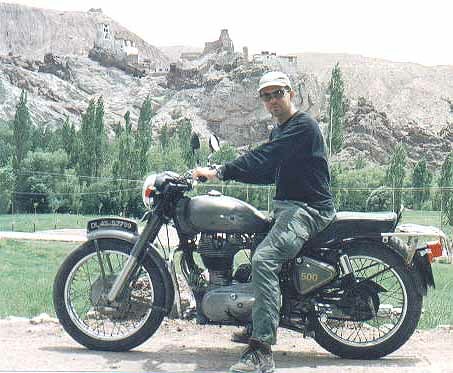 There are also some excellent online bike 'zines, the best being Motorcycle Online. Good for race coverage is the Cycle News site. I actually got an article on touring Andalucia by motorcycle published a few years ago in Motorcycle Tour & Travel, now RoadBike magazine. DCC | Auto Trader | Which Kit?